Wolves troubled a Manchester club for the second time this season, coming away from Old Trafford with a point weeks after holding defending Premier League champions Manchester City to a draw. It could have been a tough afternoon for Nuno Espirito Santo and his players when Fred, arguably against the run of play, opened the scoring for Manchester United in the 18th minute following smart play from Paul Pogba. But the hosts failed to push on, and Wolves grabbed a deserved equaliser early in the second half, through an excellent Joao Moutinho strike. 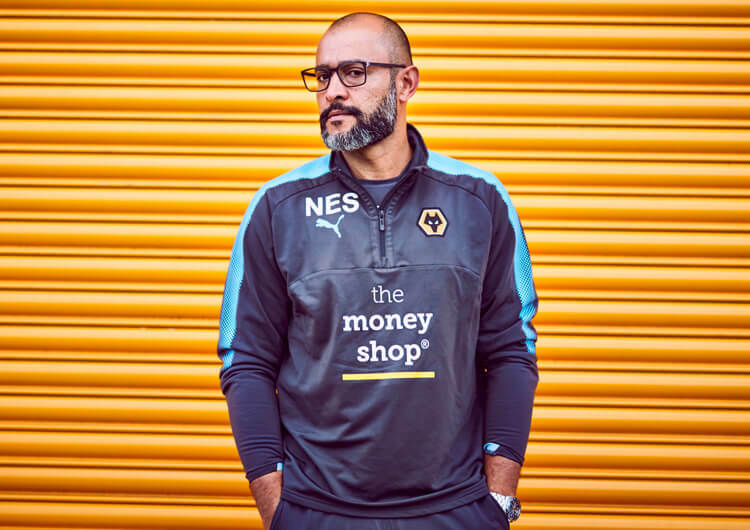 Nuno’s team have adapted brilliantly to the top flight following promotion at the end of last season, as evidenced by the fact they sit only one point behind United in the table. Head coach Jose Mourinho made two changes to his Manchester United line-up, with Nemanja Matic missing out due to suspension and Ashley Young dropping to the bench. 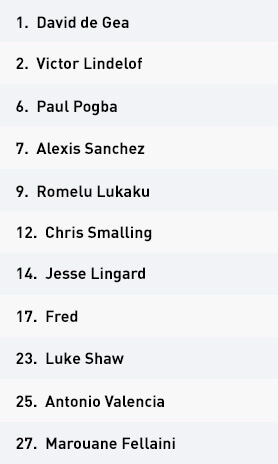 Their replacements, Fred and Luke Shaw, played respectively at central midfield and left-back in Mourinho’s preferred 4-3-3 structure. Marouane Fellaini started as a single pivot, with Paul Pogba and Fred initially looking to collect passes in between Wolves’ central midfielders and wing-backs – although Fred would often drop short to form a deeper double pivot with Fellaini, hoping to lure out a central midfielder.  The front trio of Alexis Sanchez, Romelu Lukaku and Jesse Lingard remained extremely narrow, forming a triangle that covered both inside channels and the central lane. 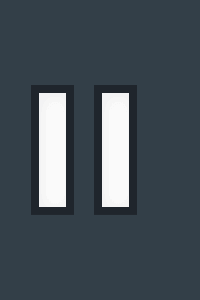 Wolves’ central midfield pairing of Ruben Neves and Joao Moutinho struggled to block early access into this triangle, as Pogba’s angled runs to the side of play created a passing lane straight into Lingard or Sanchez. The visitors’ central defence would collapse on to the ball, congesting the central play to quickly block any attempts on goal. 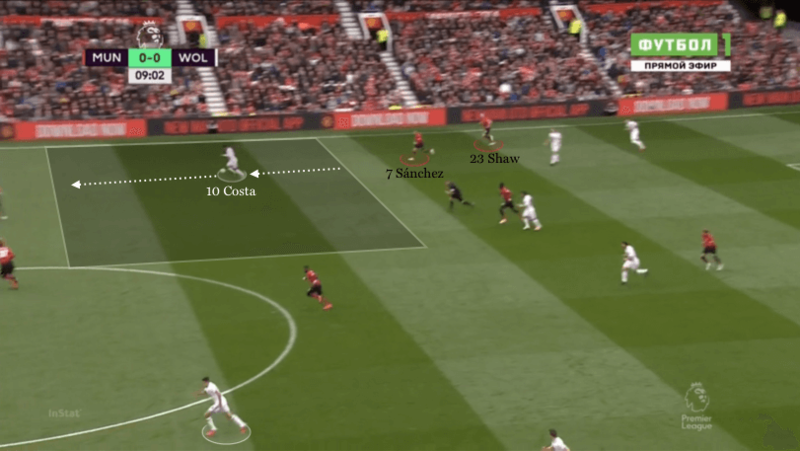 Despite Wolves generally defending solidly in the central lane, United took the lead when their opponents lost out on a second ball from a Sanchez cross. The free ball fell to Pogba, whose clever touch set Fred up to send a low driven effort into the bottom corner. The aggressive positioning of full-backs Luke Shaw and Antonio Valencia ensured both Wolves wing-backs had to drop deep into a back five, creating a temporary imbalance within the midfield unit of their mid-block structure. The United back line rarely stepped into midfield with the ball, choosing to pass between themselves across the back line. 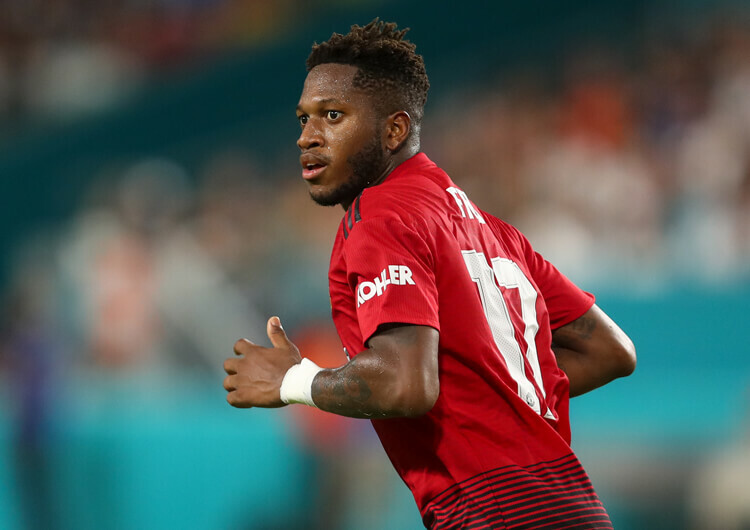 The dropping of Fred or Fellaini helped progress the ball forward, as the two central midfielders looked to split the first line of pressure. These splitting passes usually found Pogba, who continued as the highest of the three central midfielders. Once the ball had bypassed the away side’s front three, their two central midfielders were isolated against the narrow triangle of Sanchez, Lingard and Lukaku. Sanchez and Lingard remained narrow but supported around the sides of the two Wolves central midfielders, creating a three-on-two with Pogba. They could then drive and progress forward until they reached the back line, where many of their moves broke down due to Wolves having heavy numbers in central defence. United saw less and less of the ball as the first half wore on, with the inside runs of their opponents’ wing-backs causing problems for the back line. With the front three stepping on to Wolves’ back line as they built short, the visitors’ rotations within midfield ensured consistent progression well into United’s half. Shaw and Valencia were often occupied by the inside runs of Matt Doherty and Jonny – this then freed up the visitors’ attacking midfielders to receive unchallenged in wide areas. Shaw in particular continued to get caught out by the movement of Helder Costa, who frequently got in behind the left-back in the second half. Lukaku became the ideal target for early balls from deep against this proactive approach, and Pogba’s range of passing seconds after a regain within his defensive half often found the striker. With United setting up with a tight front line, Lukaku had supporting runners in the form of Sanchez and Lingard within the central lane. Fast attacking combinations between these three, as well as Pogba’s late runs from deep, helped the hosts to quickly work the ball forward – although the majority of their shots on goal were blocked by the central defence. Fellaini also started to move ahead of the ball for the first time in the match, but this had a damaging effect on their central cover – and this resulted in a Wolves equaliser. Pogba lost possession in the opening minutes of the second period and, with the protective double pivot of Fellaini and Fred not in place, Costa was free to run at Shaw on the Wolves right. His cross found Raul Jimenez, who set back for Moutinho to emphatically smash home. Both sides soon focused their efforts on attacking quickly after regains, with the diminishing quality of passing increasing the number of transitions. This period of play notably saw Pogba thrive; his ability and vision on the ball enabled him to link midfield to attack before Wolves could recover. The Frenchman’s final ball in the attacking third was also a significant source of creation, as his crosses and through balls frequently found the likes of Lingard, Lukaku and substitute Anthony Martial in advanced positions. None of the front line could get on the scoresheet, though. Fellaini made a number of late runs forward, adding another aerial presence to challenge for attacking crosses into the penalty area. Even with five minutes of injury time, though, United failed to make use of their late crosses and dropped points at home for the second time already this season. When Manchester United were in possession, Jesse Lingard and Alexis Sanchez moved inside, forming a narrow triangle with Romelu Lukaku. Fred and Paul Pogba lured out the visitors’ central midfielders, creating central access into their front line. Manchester United set up in a 4-3-3 when defending, with Lingard and Sanchez often dropping back to form a midfield five. United’s front line continued to form a narrow triangle in the central lane in the second half. Now, though, Marouane Fellaini started to run ahead of the ball, supporting more direct play into Lukaku. Wolves made great progress on the counter-attack, as Luke Shaw moved higher to overlap Sanchez’s inside movements – this provided Helder Costa in particular with the space to drive forward after a regain. Wolves converted into a 5-4-1 when defending, with Jonny and Matt Doherty recovering to form a back five. 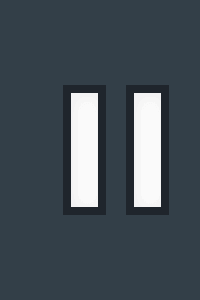 Their mid-block limited a large proportion of United’s possession into the middle third. Wolves defended deeper and deeper after grabbing their equaliser in the second half. With all 11 players often back to defend the hosts’ crosses, their counter-attacks lacked numbers and soon reduced in quantity. Wolves remained unchanged from their home victory over Burnley, as head coach Nuno Espirito Santo named an identical starting line-up for the sixth consecutive Premier League game this season. They set their attacking intentions early, managing to penetrate the hosts’ penalty area and winning a corner within 25 seconds of play starting. 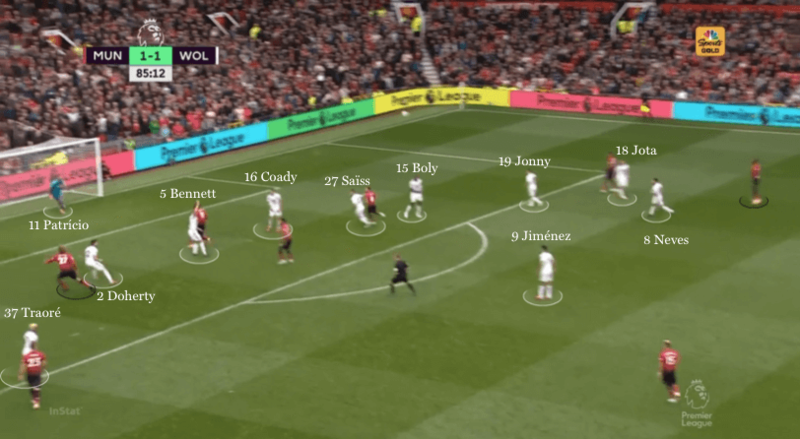 The lack of vertical compactness throughout Manchester United’s units created large spaces in which Wolves’ central midfielders could combine and dictate play. Ruben Neves frequently dropped short to collect from the back line, as the visitors insisted on building short from goalkeeper Rui Patricio. The right-sided rotations between Helder Costa and Matt Doherty provided a switch option for Neves, who occupied the left-sided central midfield role. Doherty’s inside runs lured in left-back Luke Shaw, enabling Costa, now unmarked, free to move out wide. With Alexis Sanchez pressing the back three, Costa could travel forwards unchallenged, making good progress until the congested final third. His crosses caused some minor early problems, but goalkeeper David de Gea dealt with any attempts on goal. 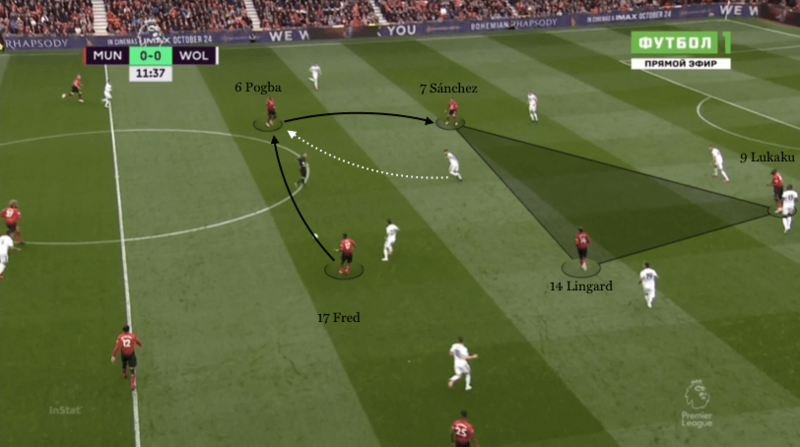 As the game progressed and United began to control more of the ball, Wolves’ transitions into attack became a more prevalent issue for the hosts. Costa and Diogo Jota dropped back with the central midfielders, creating a midfield block of four in front of the back five. 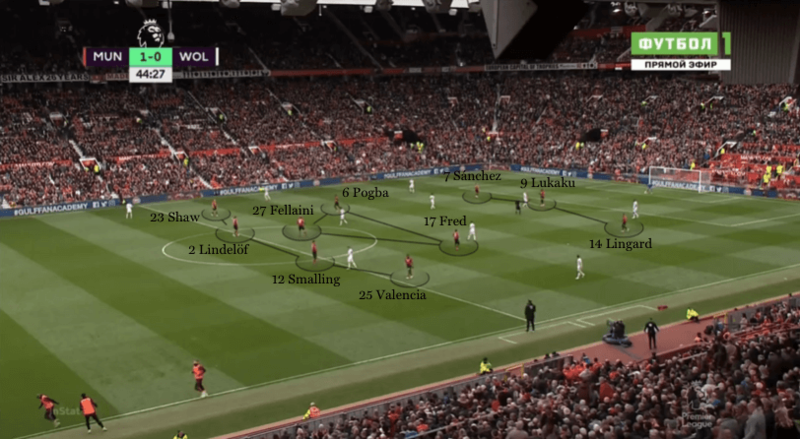 United’s full-backs then moved higher, compensating for both their wingers moving central – so if Wolves won the ball, particularly in wide areas, they could capitalise on the forward positioning of Shaw and Valencia to attack the back line. One of the hosts’ central defenders would then be forced to step out of the central lane to deal with these counter-attacks, opening up further space for Wolves to transition through. De Gea should have been tested more, but the visitors’ final ball lacked conviction. After Fred had broken the deadlock in the 18th minute, United grew in confidence and control in possession – this resulted in centre forward Raul Jimenez becoming isolated during transitional play. 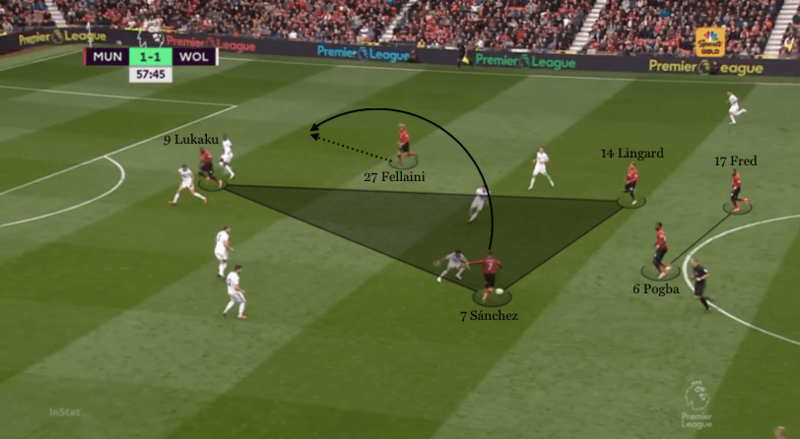 With Marouane Fellaini dropping deep from midfield when the hosts had the ball, Jimenez had pressure from all sides, should he receive the ball. The Mexican tried to link the counter-attacks, but was confronted with central defenders pressing him from the side and on the angle, as well as Fellaini from the front. They soon changed their approach on the counter, building more in wide areas before looking to link up with Jimenez once into the final third. Wolves eventually demonstrated patience in their build-up, and additional rotations in the wide areas ensured they could again sustain spells of possession. If Costa or Jota moved into the wide areas, wing-backs Doherty and Jonny provided underlapping runs forward and occasionally moved even further inside. 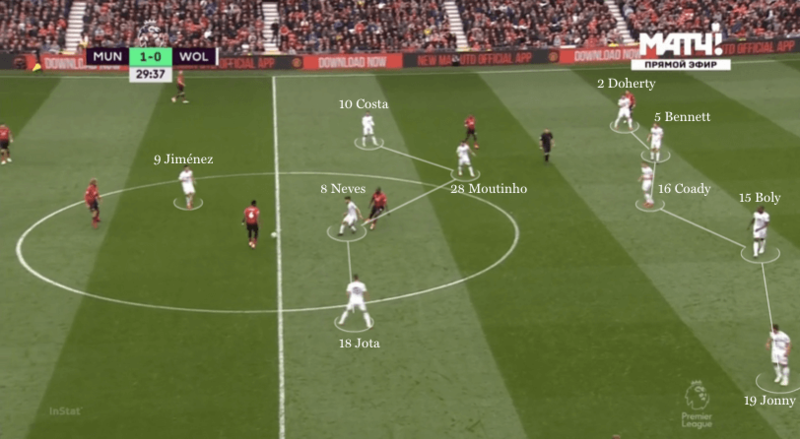 If either wing-back supported inside, they looked to overload United’s central midfield four against three – this provided one-two options for Joao Moutinho and Neves, who alternately looked to play before receiving in between their opponents’ lines. Fellaini or a centre-back was often lured out as a result, which reduced the overload Jimenez had to battle against. They had little to show from their play with regards to clear-cut chances on goal, though, with their final ball into the penalty area too often inaccurate. Six out of seven of Wolves’ goals this season have come in the second half, and that trend continued at Old Trafford. Moutinho smashed home from the edge of penalty area to level the scoreline after Neves had robbed Pogba before finding Costa in a one-on-one against Shaw. Costa supplied an accurate cross into Jimenez, who set the ball back for Moutinho to draw his side desevedly level. The game descended into messy spells of transitions, as both sides tried to attack rapidly after regaining possession. Neither could keep the ball, though, with the game increasing in attacking intensity but lacking any form of quality in possession. Wolves had to deal with spells of wide play from United, who looked to increase the number of bodies inside the penalty area and thus prioritised attacking with crosses into the likes of Romelu Lukaku and Fellaini. Record signing Adama Traore was introduced in the 75th minute, adding speed and directness to their counter-attacks from deep. But with the visitors requiring more bodies back to defend the crosses, they lacked numbers when looking to break out from deep. This reduced their main threat on the counter, allowing United to end the encounter the more dominant side. With the exception of two late breakaways from Traore, Wolves simply contained all 11 players in defence, their priority being to leave Manchester with a point.